We will be celebrating the birth of our Lord Jesus Christ on December 23 at 6 pm and we would love for you to join us. For additional information, please call Pastor Krause at (406) 533-8902. 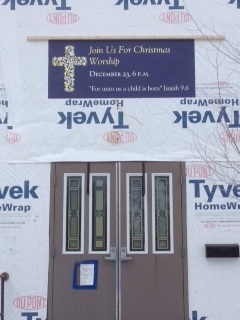 We were very excited to place our Christmas worship invite on the front of our church building this morning! As you can see, we are currently under renovations and within the next month or two, we will have a fully operational and beautiful church sanctuary for the worship of our most beautiful and awesome Triune King.